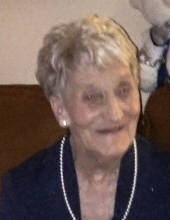 Dorothy I. Leslie, 82, of Mt. Washington passed away April 8, 2019. She was a native of Shepherdsville, KY and a member of Beech Grove Baptist Church in Shepherdsville. She was preceded in death by her loving husband in 1998, Farris Leslie. She is survived by her children, Irene Brooks (David), Danny Leslie (Brittany), Michael Leslie (Charlene) and Jimmy Leslie (Mattie); brother, Reverend Norman Daley; 11 grandchildren and 5 great grandchildren. Her funeral will be 10:00 a.m. Thursday at Schmid Funeral Home in Mt. Washington with burial in Highland Memory Gardens. Visitation will be Wednesday from 2:00pm to 7:00 p.m. .
To send flowers or a remembrance gift to the family of Dorothy I. Leslie, please visit our Tribute Store. "Email Address" would like to share the life celebration of Dorothy I. Leslie. Click on the "link" to go to share a favorite memory or leave a condolence message for the family.